Governor Andrew M. Cuomo today delivered his 2019 State of the State Address. The Governor's 2019 Justice Agenda ensures the promise of full, true justice for all. While the federal government's dysfunction and shutdown persists, the Governor is leading the way forward. The Justice Agenda protects New Yorkers from Washington's devastating federal attacks, strengthens the middle class, safeguards the environment, improves the health of our communities and invests in our infrastructure for the 21st century. For the ninth consecutive year, the Budget is balanced and holds spending growth below two percent. In December, in the face of the nation's biggest social crisis, and with the federal government seeking to undo generations of progress, Governor Cuomo laid out his legislative agenda to enable the Legislature to commence action on these top priorities immediately upon convening. In this State of the State Address, the Governor called on the Legislature to swiftly and immediately act on these priorities in the first 100 days of session. 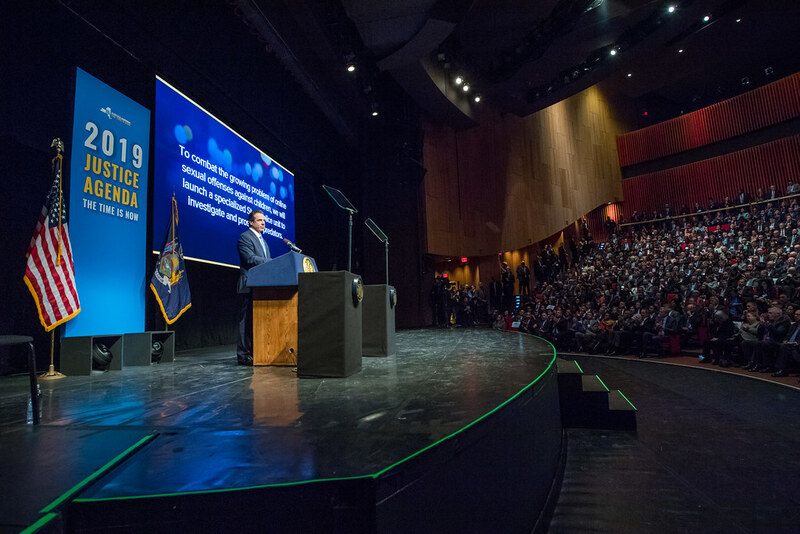 "In the face of unprecedented challenges on a national level and a federal government at a complete standstill, New York will deliver on the most productive agenda in our history and build on our record of accomplishments," Governor Cuomo said. "This is a true Justice Agenda that ensures our neediest schools receive an equitable share of funds, advances historic criminal justice reform, safeguards our health care, protects the rights of women in our state from the federal government, and leads the nation in fight against climate change and contaminants in our environment and our water. While extreme conservatives in Washington govern by division and fuel dysfunction, New York State will raise the beacon of progress and take action to make a real difference in people's lives." Continue the Phase-In of Middle Class Tax Cuts: The Budget supports the phase-in of the middle class tax cuts. Under these reforms, rates will continue to drop to 5.5 percent and 6 percent when the cuts are fully phased in - an up to 20 percent cut in income tax rates for the middle class - and produce a projected $4.2 billion in annual savings for six million filers by 2025. As the new rates phase in, they will be the State's lowest middle-class tax rates in more than 70 years. Extend the Millionaire's Tax: To protect the progress that has been made in enhancing progressivity and ensuring tax fairness for New York's middle-class, Governor Cuomo is proposing a five-year extension of the current tax rate on millionaires. This will preserve an estimated $4.4 billion annually otherwise unavailable to make vital investments in education and infrastructure to secure New York's future economic prosperity. Make Permanent the Highly Successful Property Tax Cap: Governor Cuomo made a first-ever property tax cap a hallmark of his first campaign for Governor and a priority of his administration's first year. Since the implementation of the tax cap in 2012, growth has averaged approximately 2 percent and the tax cap has produced approximately $25 billion in taxpayers' savings. The Governor proposes that New York preserve and make permanent the property tax cap, as he has advocated in the past. Close the Carried Interest Loophole: Because of an egregious loophole in federal law, some of the wealthiest people in the country, including hedge fund managers and private equity investors, are paying lower tax rates on their income than many middle class families. This "carried interest" loophole results in a substantial cost to middle-class New Yorkers, with the State losing about $100 million every year. To ensure that the wealthiest Americans are paying their fair share, Governor Cuomo will take a landmark step to close the carried interest loophole under New York State law and effectively eliminate the benefits of this loophole under the federal tax code. Continue Lawsuit Against Federal Government Challenging Unconstitutional Tax Law That Targets New York: Governor Cuomo and Attorney General Barbara D. Underwood filed a lawsuit to protect New York and its taxpayers from Washington's drastic curtailment of the SALT deduction. The lawsuit argues that the new SALT cap was enacted to target New York and similarly situated states, that it interferes with states' rights to make their own fiscal decisions, and that it will disproportionately harm taxpayers in these states. The Governor and Attorney General Letitia James will continue in their fight to overturn the law's unprecedented and unconstitutional limitations on SALT deductibility. Invest an Additional $150 Billion in the Nation's Largest Infrastructure Program: Governor Cuomo has made an unprecedented commitment to invest $150 billion in infrastructure projects over the next five years. Beginning in FY 2020, these capital projects will rebuild transportation and mass transit systems, drive economic and community development, create new environmental and park facilities, and support our sustainable energy future. Reduce Traffic Congestion in NYC and Fund the MTA: This year, the Governor will implement congestion pricing to establish a reliable funding stream to transform the transit system and reduce congestion in Manhattan. By charging fees for vehicles to move within the most congested area of New York City and then reinvesting those funds into transit improvements, this plan will combat gridlock and deliver to New York City's residents and visitors the world-class transit system they deserve. Expand Design-Build and Enact Other Efficiencies to Expedite Construction Projects: Governor Cuomo's $100 billion infrastructure program is the nation's largest and boldest. Key to the program's success is the Governor's visionary decision to deploy the design-build method on complex projects, saving taxpayers time and money by making a single contractor responsible for both a project's design and its actual construction. To ensure efficiency across State projects, the Executive Budget includes legislation authorizing the use of state-of-the-art methods such as construction manager at-risk and construction manager-build, while expanding design-build to additional agencies. Invest in Communities Across the State Through the Fourth Downtown Revitalization Initiative: The Downtown Revitalization Initiative is transforming downtown neighborhoods into vibrant communities where the next generation of New Yorkers will want to live, work and raise families. Participating communities are nominated by the State's ten REDCs based on the downtown's potential for transformation. Through three rounds of awards, each winning community was awarded $10 million to develop a downtown strategic investment plan and implement key catalytic projects that advance the community's vision for revitalization. The Executive Budget provides $100 million for the Downtown Revitalization Program Round IV. $1 Billion Education Aid Increase: State support for school districts will have increased by $8.1 billion (42 percent) since FY 2012. Over 70 percent of this year's increase goes to high-need school districts. Foundation Aid is increased by $338 million. Expand Master Teacher to High Poverty Schools to Increase Access to Advanced Courses: In 2013, Governor Cuomo launched the New York State Master Teacher Program to strengthen our nation's STEM education, giving selected educators an annual $15,000 stipend for four years, professional development opportunities and a platform to foster a supportive environment for the next generation of STEM teachers. In order to recruit and retain outstanding educators in the highest poverty schools, the Executive Budget will provide $1.5 million to support 100 new Master Teachers who teach in high-poverty schools with high rates of teacher turnover or high rates of relatively inexperienced teachers. Launch the $175 Million Workforce Initiative: Governor Cuomo will launch a new Consolidated Funding Application for workforce investments that will support strategic regional efforts that meet businesses' short-term workforce needs, improve regional talent pipelines, expand apprenticeships, and address the long-term needs of growing industries — with a particular focus on emerging fields with growing demand for jobs like clean energy, health technology, and computer science. These funds will also support efforts to improve the economic security of women, youth, and other populations that face significant barriers to career advancement. Limit Security Deposits to Reduce Housing Barriers: Governor Cuomo will propose legislation to limit security deposits to a maximum of one month's rent across New York State, making New York's security deposit limits among the strongest in the nation This law will serve to ensure that burdensome security deposits will no longer serve as a barrier to entry for anyone trying to find a new place to live. Enact Source of Income Protections to Support Fair Housing for All: In certain parts of New York State, landlords can reject applicants based on their lawful source of income, disproportionately impacting households that rely on non-wage income or income assistance and those who use vouchers to obtain housing for their families. The Governor will work with the legislature to amend the New York State Human Rights Law to prohibit discrimination based on lawful source of income statewide to ensure that such lawful income is not a blanket barrier to housing, reducing financial instability for New York's most economically vulnerable individuals. Support ESPRI Communities and Establish ESPRI Representation on REDC Workforce Development Committees: In 2016, Governor Cuomo created the Empire State Poverty Reduction Initiative (ESPRI) to combat poverty and reduce inequality. ESPRI is an important component of the Governor's anti-poverty agenda, and this year Governor Cuomo proposes to build on the success of these State and local partnerships to address poverty, supporting more community-based efforts through continued funding of ESPRI. Governor Cuomo will also continue to support efforts by the REDCs and the economic development community to broaden and deepen their commitments to local anti-poverty efforts and he will ensure an ESPRI representative is included on each region's Workforce Development Committee and involved in the review process for the Governor's new Workforce Development Initiative. Continue the Revitalization of the Great New York State Fairgrounds: The State Fair drives $100 million a year in economic activity in Central New York and thousands of jobs. Under Governor Cuomo's leadership, New York State has invested more than $120 million dollars in two phases over the last three years to remake the New York State Fairgrounds. To continue the transformation of the State Fairgrounds, the State will make additional renovations and upgrades to enhance user experience. The Governor's commitment continues to make the fairgrounds a year-round destination. Fund Key Programs to Support New York's Farmers: The agricultural industry is full of variability and uncertainty. As a reflection of the Governor's resolve to support New York's farmers, this year's Executive Budget will continue funding the specialized technical assistance, industry promotion, and research investments statewide to reduce farms' exposure to economic and climate inconsistency. Improve Transparency in the Discovery Process: As only one of ten states where prosecutors can withhold basic evidence until the day a trial begins, Governor Cuomo's plan will bring New York's discovery process into the 21stcentury by requiring both prosecutors and defendants to share all information in their possession well in advance of trial. Defendants will also be allowed the opportunity to review whatever evidence is in the prosecution's possession prior to pleading guilty to a crime. Transform the Use of Solitary Confinement in State Prisons: Under Governor Cuomo's leadership, New York has dramatically reformed and reduced the use of solitary confinement for people who engage in misconduct within state prisons. The Governor is directing DOCCS to accelerate the momentum of solitary confinement reform by limiting the length of time spent in separation, building dedicated housing units for rehabilitation and integration following a disciplinary sanction, and expanding therapeutic programming to reinforce positive and social behavior. Pass the Domestic Violence Survivors Justice Act: Governor Cuomo will advance the Domestic Violence Survivors Justice Act, which will build on Jenna's Law to include more meaningful sentence reductions and encompass crimes committed not only against, but also at the behest of, abusers. The Act will also permit a small population of currently incarcerated survivors to apply for re-sentencing and earlier release due to their prior victimization. Increase Protections Against Harassment in the Workplace: Building on the nation's most comprehensive sexual harassment package signed into law by Governor Cuomo in 2018, Governor Cuomo will advance legislation to lower the high bar set for employees to hold employers accountable under the New York Human Rights Law for sexual harassment, protect employees' rights to pursue complaints, and ensure workers know their rights, by requiring all employers to conspicuously post a sexual harassment educational poster in their workplace. Modernize New York's Pay Equity Law: Since taking office, Governor Cuomo has fought aggressively to close the gender pay gap in New York. This year, Governor Cuomo will build upon that effort by championing the passage of a salary history ban. In addition, the Governor will advance legislation to expand the definition of "equal pay for equal work" to require equal pay on the basis of race, ethnicity, gender, and other protected characteristics, and expand the requirement that equal pay be provided for all substantially similar work, adding flexibility in recognition of the complexity of the issue. Establish Extreme Risk Protection Orders to Save Lives: Governor Cuomo will continue to champion the Red Flag Bill, also known as the Extreme Risk Protection Order Bill, which would prevent individuals determined by a court to have the potential to cause themselves or others serious harm from purchasing, possessing, or attempting to purchase or possess any type of firearm, including handguns, rifles, or shotguns. This legislation builds on New York's strongest-in-the-nation gun laws, and, if passed, would make New York the first state to empower its teachers and school administrators to prevent school shootings by pursuing court intervention. Public Financing of Elections: There is no incentive in today's campaign finance system for candidates to focus on ordinary donors. Large donors provide large donations which drown out the voices of ordinary people. Public campaign financing is the remedy to this problem. By enacting a 6:1 public financing matching ratio for small donations, candidates will be incentivized to focus on small donors. Strengthen Disclosure Laws that Expose Dark Money in Politics: In June 2016, Governor Cuomo advanced ethics reform legislation to address the impact of Citizens United v. Federal Election Commission, 558 U.S. 310 (2010). The Governor cautioned about the increase of dark money in politics and promised to "strengthen disclosure requirements and mandate that groups report the identity of anyone exerting control over them." In August 2016, the Governor signed into law New York Executive Law § 172, which requires disclosures of political relationships and behaviors widely recognized to be influential but which operate in the shadows. Now, with the lessons of the 2018 election in hand, the Governor proposes strengthening this law in a variety of ways to assure all New Yorkers have critical information about who is actually speaking to them. Further, the Governor is seeking to streamline the reporting process for 501(c)(3) and 501(c)(4) organizations, including by providing a mechanism for organizations to apply for a statutory exemption before the start of a reporting period. Codify Executive Order Prohibiting State Agencies from Inquiring About Immigration Status: In 2017, Governor Cuomo issued Executive Order 170, prohibiting State agencies and officers from inquiring about or disclosing an individual's immigration status unless required by law or necessary to determine eligibility for a benefit or service. Building upon further amendments to the Executive Order, Governor Cuomo proposes codifying the protection of the amended EO 170 into law. Banning Conversion Therapy: Governor Cuomo supports legislation to expand the definition of professional misconduct for professions licensed under the education law to include engaging in, advertising for, or allowing someone under one's direction or oversight to engage in conversion therapy with a patient under the age of eighteen years. Ban the "Gay Panic" Defense: Governor Cuomo will again push to close the loophole in New York State by passing legislation to ban gay and trans panic defenses. In the face of unprecedented challenges on a national level and a federal government at a complete standstill, New York will deliver on the most productive agenda in our history and build on our record of accomplishments. Launch a Comprehensive Substance Use Prevention Blueprint for Schools: At Governor Cuomo's direction, New York State will launch a statewide collaborative to streamline all prevention resources and develop best practices, standards, and metrics for substance use prevention into a focused "Prevention Blueprint" that will assist schools to follow a comprehensive, evidence-based and data-driven approach to prevention. OASAS shall work in collaboration with the State Education Department, Department of Health and the Office of Mental Health to develop the Prevention Blueprint for use in the 2020-21 school year. Clarify the Department of Health's Authority to Ban the Sale of Certain Flavored E-Cigarette Liquids: Flavored combustible cigarettes, except menthol, were banned by the FDA in 2009 to reduce youth smoking as they were frequently used as a starter product. Most e-cigarette users said their first e-cigarette was flavored. Flavors, such as sweet tart, toffee, and bubble gum, make e-cigarettes more attractive and make e-cigarettes more attractive to youth. Legislation is being introduced to provide the Department of Health the authority to ban the sale of flavored liquids that target youth use of e-cigarettes. Restricting Available Discounts Provided by Tobacco and Electronic Cigarette Manufacturers and Retailers: New York has the highest cigarette tax in the nation, but manufacturers and retailers have developed tactics to reduce prices, such as "buy one, get one free" discounts. These tactics directly target price-sensitive consumers, including youth. Restricting discounts on tobacco and vapor products will strengthen the impact of New York's tax on tobacco and disincentivize tobacco use. Invest in Community-Based Supports for Aging New Yorkers: Governor Cuomo proposes investing $15 million in community-based supports for aging New Yorkers. This needed targeted investment in NYSOFA's programs and services will help serve more older adults and will help them maintain their autonomy, support family and friends in their caregiving roles, and delay future Medicaid costs. Working with the Department of Health, NYSOFA will develop specific metrics to evaluate the success of this investment. Establish $10 Billion Green Future Fund: This year, Governor Cuomo will advance a $10 billion Green Future Fund to support clean water infrastructure, renewable energy and clean transportation, and open space and resiliency. This fund includes $5 billion in total for drinking water and wastewater infrastructure—building upon the $2.5 billion Clean Water Infrastructure Act and effectively doubling the state's investment in clean water over the next five years. Continue Historic $300 Million Environmental Protection Fund: Governor Cuomo proposes maintaining the State's historic $300 million EPF. This investment will prioritize programs to protect New York's water bodies, promote stewardship projects in parks and on other state lands, revitalize municipal waterfronts, and build community resilience to climate change—all while creating jobs and stimulating local economies.